In India family ties maybe strong, but poverty is what finally counts. 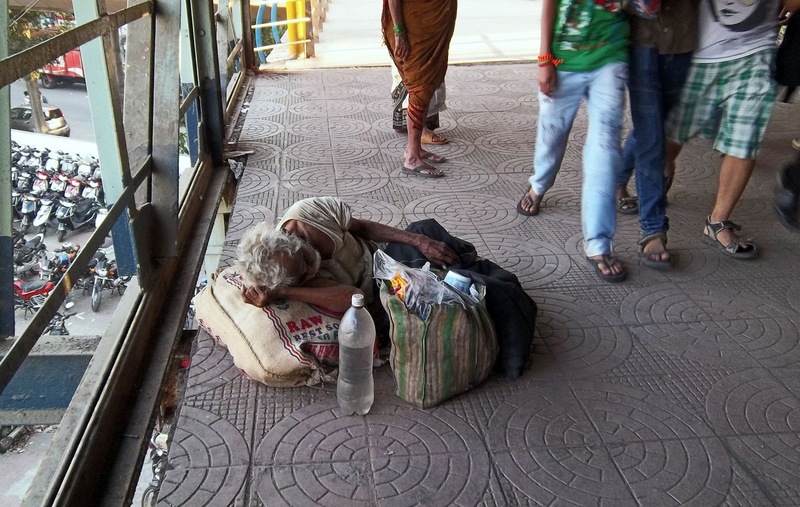 The number of old and destitute people on the streets of India are high because neither the state nor their families look after them. 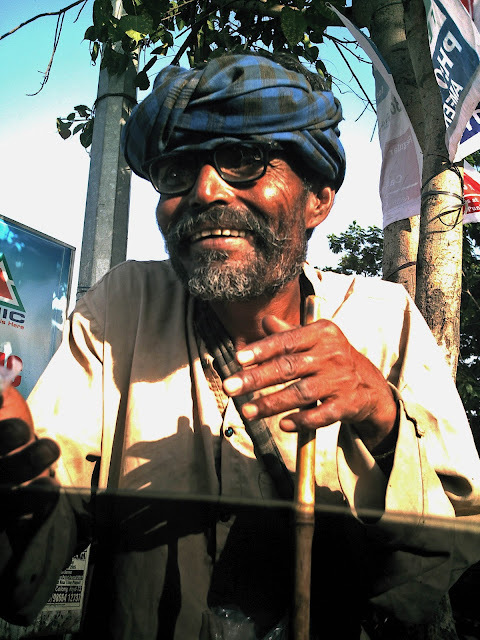 These are pictures of some elderly men in different cities of India. This first picture was shot in Mulund, a suburb of Mumbai. This old beggar man in a red bandana and saffron robes came dashing towards the rickshaw we were traveling in, just as the light turned red. 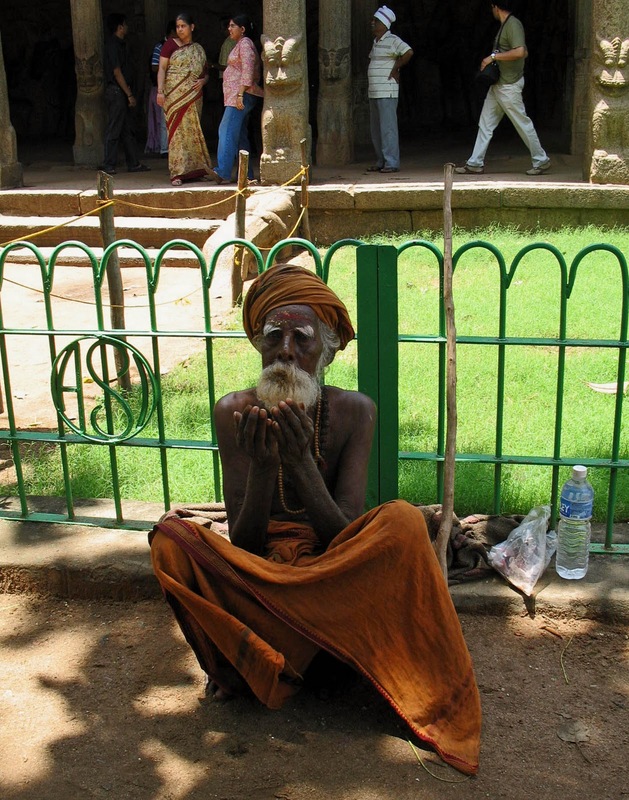 The two pictures below are of an old beggar at Mammalapuram, a popular tourist site near Chennai, Tamil Nadu. Many beggars wear saffron as it is a sacred colour in Hinduism and gives them "respectability". 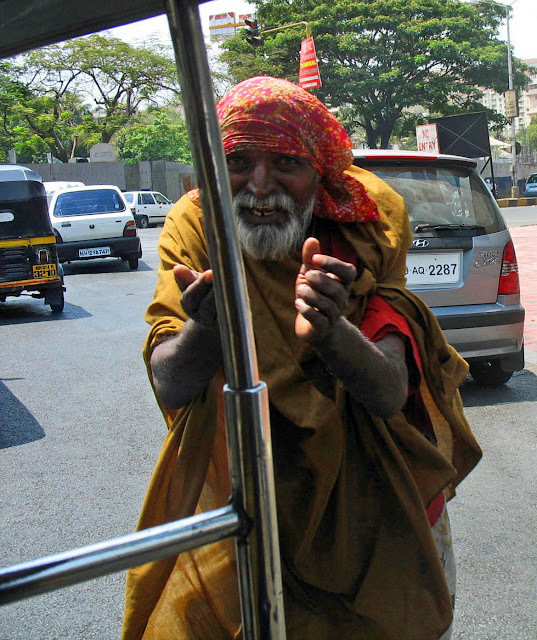 The beggar below is not only wearing a saffron lungi, he has a large tilak on his forehead and brown holy beads around his neck. If you don't mistake him for a godman, he could pass off for a devotee. A walking stick, a small dirty blanket, remnants of food and a plastic water bottle lie near him, to keep him company the whole day. In the background is a part of a temple at Mammallapuram and some tourists. The same old man shot from another angle, this time without the temple background. A green fence and a lawn form the background of this picture. The picture below was taken on a railway pedestrian bridge at Thane railway station. 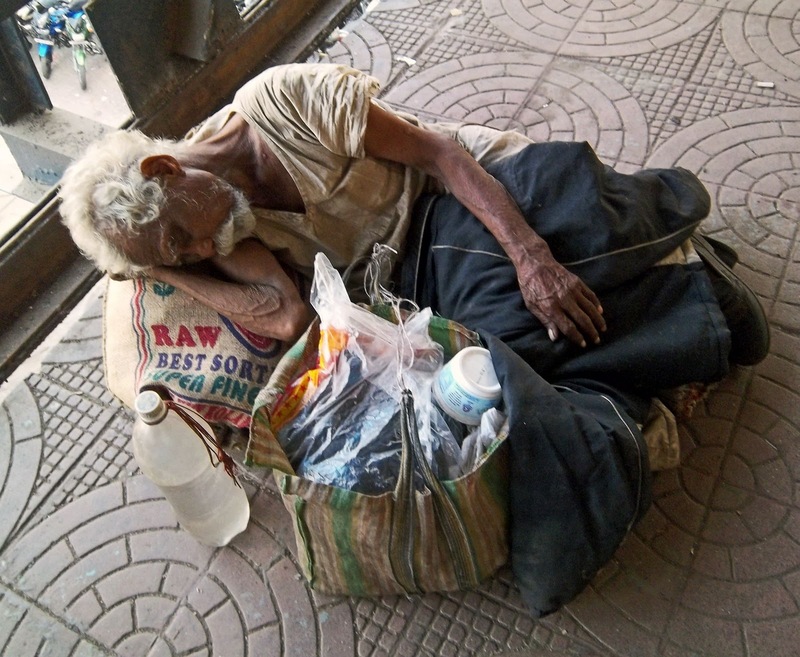 People whizzed by, not noticing the old destitute man, who seems homeless. This is a closer look at the man who is fast asleep. His hair is completely white, his banyan or vest unwashed and he is clutching a synthetic jacket of some kind to cover his body. His meagre belongings lie next to him as well as a water bottle which looks old and dirty. 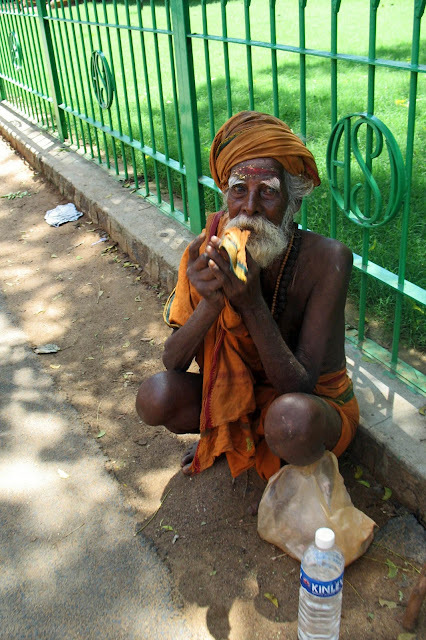 This old beggar seen in the portrait below has been shot on the streets of Hyderabad in Andhra Pradesh. 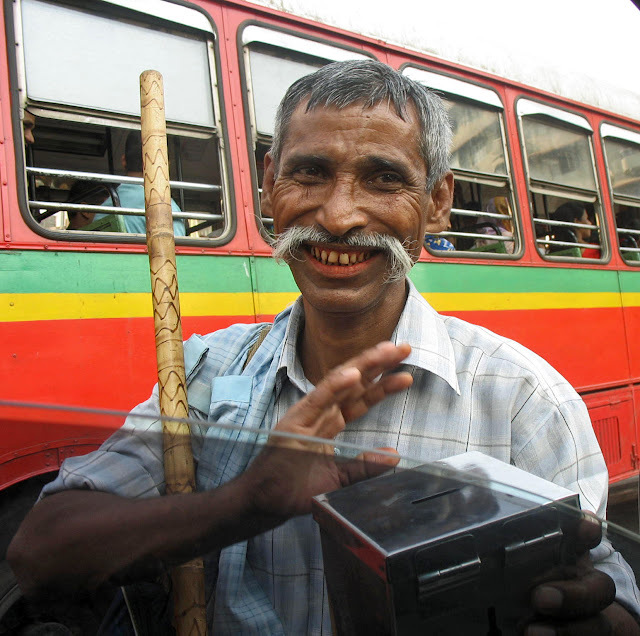 The smiling man below was caught on camera in central Mumbai, near Dadar. A municipal bus is in the background. He seems quite organised, and not as badly off as the other beggars. He looks healthy, his stick fancy, and the tin box he is carrying is a sturdy metal piggy bank! 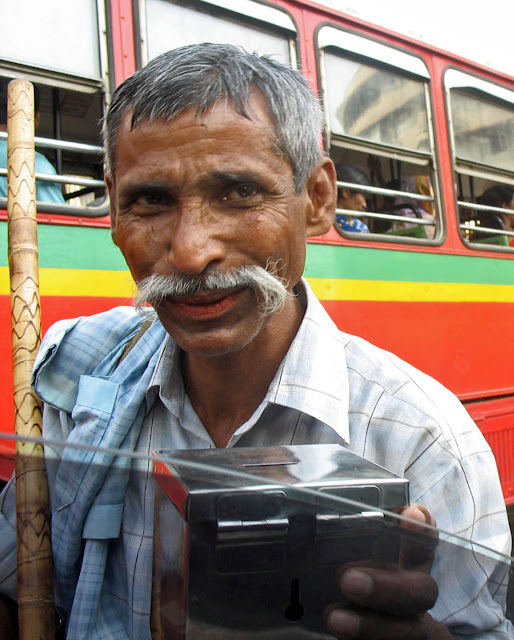 His lips are red from the stains of paan. He may be begging, and maybe homeless, but he certainly does not look to be starving. When I fished out my camera, he actually turned coy.